Shoe shops in the 19th century were often crowded with both people and merchandise. Shoes were displayed all around the shop, mostly on shelves but sometimes hanging from rails near the ceilings. Each store would have had two or three shop assistant, each dressed in a simple uniform to distinguish them from the proprietor, who wore a traditional shoemaker's apron. 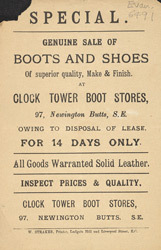 Shop windows were filled with a variety of men's and ladies' shoes. They were not usually presented in any particular order and so looked very chaotic.